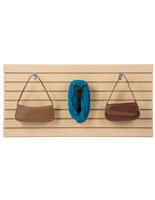 Unfinished slatwall provides retailers with a few ways to incorporate these merchandising fixtures in their store. Manufactured with Anchor™ Core, the material is 50% stronger than standard MDF construction and made with recycled wood fiber. Priced the same as regular MDF, the substrate can support up to 40 lbs. per groove. As for its appearance, this unfinished slatwall can be used "as is" for a natural look in organic shops or stores specializing in recycled goods. 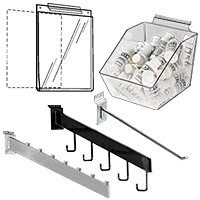 Conversely, the material will accept any painted finish for customizing your establishment's interior decor. Since most stock slatwall is available in standard finishes such as black, white, maple, and cherry, unfinished slatwall offers the opportunity to decorate using specific company colors for a more cohesive presentation. Offered here are two versions of wall mounted panels, with or without metal channel inserts.